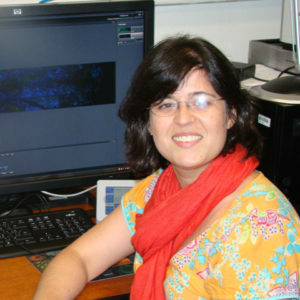 Mariana Carvalho is a Research Engineer in the Nano Devices group at INL. Her research is focused on the development of new tools for in vivo diagnosis, specific in applications on cardiovascular diseases. Her main research area is in Bio-nano-photonics, primarily in optical coherence tomography (OCT) and optical microscopy (SPIM, fluorescent, confocal and non-linear microscopy). Mariana holds a Physics Bachelor’s degree (2001), MSc (2002) and DSc (2006) from UFPE-Brazil, where she worked in the Biophotonics group at the physics department. She was a visiting student at MIT-USA (2004-2005), in Prof. James Fujimoto’s group, working with spectral OCT. She worked, for 3 years in the industry, developing optical systems for devices for ophthalmic purposes and for aerospace cameras. She was a postdoc researcher at IFSC/USP (2010-2013), working on multiphoton microscopy and photodynamic therapy. She was a visiting researcher at Durham University (2014-2015) working on adaptive optics systems applied for SPIM. Before coming to INL, she was a postdoc researcher at UFPE, working on nonlinear optics applied to the research and characterization of random lasers, developing nanomaterials for larvae control and OCT applied to skin diseases and to dentistry. Buckley, C., Carvalho, M. T., Young, L. K., Rider, S. A., McFadden, C. Berlage, C., Verdon, R. F., Taylor, J. M., Girkin, J. M., Mullins, J. J.
Gomes, A. S. L., Carvalho, M. T., Dominguez, C. T., de Araújo, C. B. and Prasad, P. N.
Direct three-photon excitation of upconversion random laser emission in a weakly scattering organic colloidal system. Optics Express, v. 22, p. 14305-14310. 2014. Srinivasan, V. J., Ko, T. H., Carvalho, M. T., et al. Noninvasive volumetric imaging and morphometry of the rodent retina with high-speed, ultrahigh resolution Optical Coherence Tomography. Retina, Investigative Ophthalmology & Visual Science., v.47, p.5522 – 5528, 2007. Srinivasan, V. J., Wojtkowski M., et al. Ophthalmology (Rochester)., v.113, p.2054.e1 – 2054.e14, 2006.